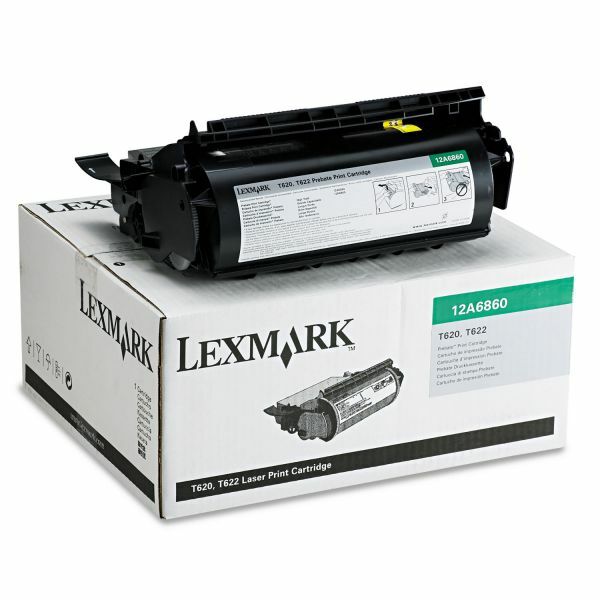 Economical single-use cartridge and recyclable at Lexmark™. Lexmark 12A6860 Return Program Toner, 10000 Page-Yield, Black - Toner cartridge delivers outstanding results page after page in your Lexmark T620, T620dn, T620in, T620n, T622, T622dn, T622in, T622n and X620e. Superior Lexmark design means precision pairing between printer and cartridge for value, quality and environmental responsibility you can count on. Lexmark Return Program Cartridges are sold at a discount vs. the prices of regular cartridges in exchange for the customer's agreement to use the cartridge only once and return it only to Lexmark for remanufacturing or recycling. Cartridge yields 10,000 pages at approximately 5 percent coverage. Prebate supplies are now called Lexmark Return Program cartridges. Details of the license program remain the same. Only the name has changed. For a period of time, when you order a Return Program cartridge, you may receive a Prebate cartridge. We appreciate your patience during this transition. Lexmark Return Program Cartridges are sold at a discount versus the prices of regular cartridges in exchange for the customer's agreement to use the cartridge only once and return it only to Lexmark for remanufacturing or recycling. Regular cartridges without this license/agreement sold at regular prices are also available. Regular cartridges are also recyclable at no cost through Lexmark Cartridge Collection Program.